Amazing moments at Maker Faire Rome: thank you for participating! Next saturday 5th of October Massimo Banzi with Jason Kridner and Gerald Coley (Texas Instrument) will talk about the new collaboration on Arduino TRE during a talk at Maker Faire Rome ( from 15.30 in Room G – Archimede). Thanks to the 1-GHz Sitara AM335x processor, Arduino developers get up to 100 times more performance with the Sitara-processor-based TRE than they do on the Arduino Leonardo or Uno. This performance opens the doors to more advanced Linux-powered applications. The Sitara-processor-based Linux Arduino can run high-performance desktop applications, processing-intensive algorithms or high-speed communications. The Arduino TRE is two Arduinos in one: the Sitara-processor-based Linux Arduino plus a full AVR-based Arduino, while leveraging the simplicity of the Arduino software experience. The integration of the AVR Arduino enables the Arduino TRE to use the existing shield ecosystem so that innovators can expand the Arduino TRE to develop a wide range of high-performance applications such as 3D printers, gateways for building automation and lighting automation, telemetry hubs that collect data from nearby sensors wirelessly, and other connected applications that require host control plus real-time operations. In addition, the Arduino TRE is partially the result of a close collaboration between Arduino and the BeagleBoard.org foundation. These open hardware pioneers share a passion for expanding open source development and making technology accessible for artists, designers and hobbyists. The TRE design builds upon the experience of both Arduino and BeagleBoard, combining the benefits of both community based boards. 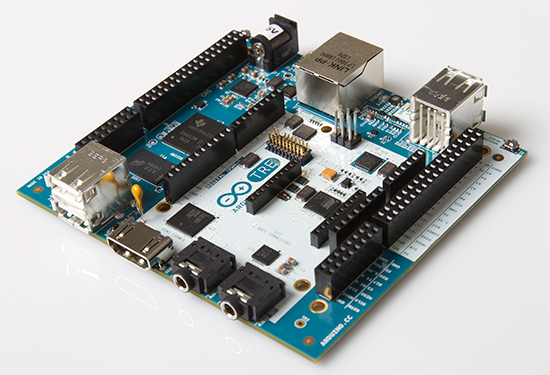 “By choosing TI’s Sitara AM335x processor to power the Arduino TRE, we’re enabling customers to leverage the capabilities of an exponentially faster processor running full Linux,” said Massimo Banzi, co-founder, Arduino. The Arduino TRE is expected to be available in spring 2014 but you’ll be able to see it live during Maker Faire Rome. See more pictures of Arduino TRE on Flickr. Do we have specs and pricing yet? Will there be an integrated JTAG debugger, as there is with the BeagleBone? What kind of AVR will be used on the board? An atmega328 or atmega32u4? According to the TI page, it’s going to have an ATmega32u4. The tiny 2-row connector at the right of the logo, either it’s a strange new design, or someone tried to plug something the wrong way! The Sitara AM335x have I/O capabilities that easily outperform an ATmega32u4. Why not using RTAI or Xenomai to run a virtual Arduino directly on the Sitara AM335x ? For a lot of simple applications, a Linux executable with SCHED_FIFO scheduling should be enough. I have so many questions I don’t know where to start. Please please release some specs! This wouldn’t be a “shot across the bow” to Raspberry Pi, would it? Not that I’m complaining, just wondering. The reference to “full Linux” is what got me thinking this way. I see an HDMI slot.. So this thing is aimed squarely at the Raspberry Pi. But I’m betting the price is going to be up around $100-$150.. Maybe I’m wrong, but the Due couldn’t even get it’s price down below Pi level, and it’s 1/4 the unit that this thing is. So… it’s a kind of BeagleBoard with an additional AVR MCU on it? I guess the price will play a important role on making it as popular as Rasperry Pi. Please make it possible to use the audio jacks as analog and digital GPIOs because there are many devices out there that can communicate over the audio jack, like graphical calculators from Casio or Texas Instruments, MP3-Players like iPod Nano, etc. Why do they keep including the (hugest part on that board) Ethernet socket? Doesn’t everyone have WiFi these days? As far I’ve understood the Arduino Tre is a BeagleBone Black glued via a serial port to an Arduino Leonardo. I beg your pardon for roughly simplify what I’ve learned talking with a promoter at the MakerFaire in Rome last sunday. Is it possible technically to bootstrap a new Android kernel? Stock vanilla, for example, with support of custom HW modules? Please!!! Don’t do the mistake to provide only 512MB of RAM! Give us 1024MB to be able to do also development on this Linux machine. It will be fantastic! So please! Think twice! Is better for us to buy only this board instead of this and another dedicated PC for development. Many of us may be forced to delay the acquisition of this board because they need a PC first! So would you be able to run a different linux-based operating system on it? Eagerly waiting for the TRE to be available. Any idea when they will be ready? Well, it is summer 2015. Now more than a year overdue. What’s going on? Where can we pick one of these up? I really like the looks and very interested in implementing this for a large project. Ive been anxiously waiting since 2013 as well!!! !